Christie’s announces the launch of a new marquee event in London, entitled “Middle Eastern Art”, which brings together exhibitions and auctions from the Islamic and Indian Worlds, Rug & Carpets (now being integrated into the Islamic sale) as well as for the first time Middle Eastern Modern & Contemporary Art in London. The exhibition at Christie’s London opens to the public on 21 October, and the auctions will take place on 25 and 26 October. After holding solely Middle Eastern Modern + Contemporary Art auctions in Dubai for the past 11 years, Christie’s has taken the decision to move their October auction to London to further enhance the international appeal and recognition for Middle Eastern Art. The traditional March sale week will continue to take place in Dubai and will occur during Dubai Art Season. Christie’s upcoming auction for Middle Eastern Modern and Contemporary Art in London will be taking place on Wednesday 25 October at 7.00pm, presenting a curated sale around the modern masters and the Contemporary artists from this part of the world, with approximately 60 works, mostly consigned by private collectors, and led by and important group of works by Egyptian artists, highlighted by their recognised master Mahmoud Said (1897-1964). 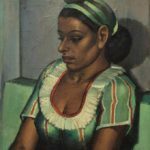 The recently published catalogue raisonné of Mahmoud Saïd, co-written by Valerie Hess from Christie’s, revealed that Mahmoud Saïd painted two versions of La fille aux yeux verts (The Girl with Green Eyes). One painted in 1931, which is still part of the collection of the Museum of Modern Art in Cairo and a year later, in 1932 La fille aux yeux verts (réplique) (The Girl with Green Eyes (Replica)), originally in the collection of Charles Terrasse, the first director of the Museum of Modern Art in Cairo, and now for sale at Christie’s. The identity of the sitter is unknown but its intriguing subject makes it stand out within the Alexandrian master’s oeuvre. 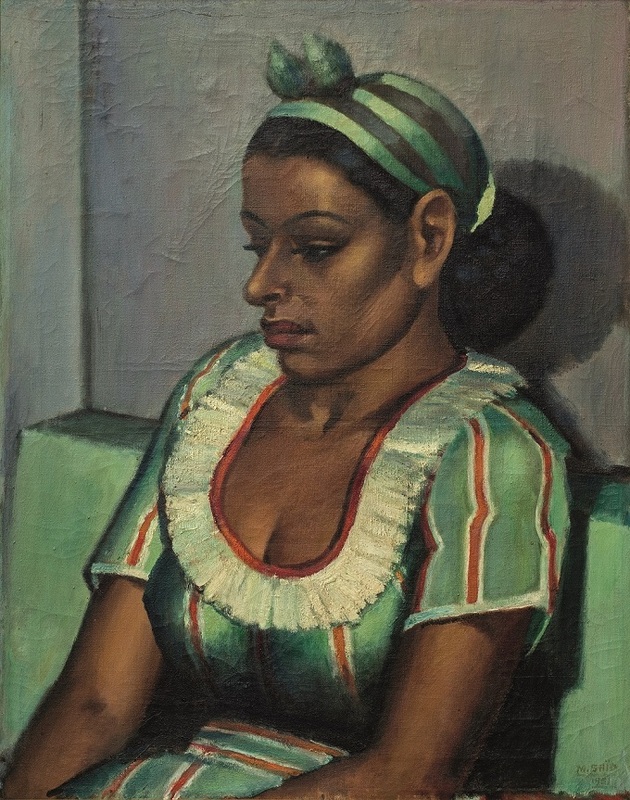 The early 1930s were marked by a series of family and friends’ portraits that Saïd produced and yet, it was also in those years that the ‘Mahmoudsaïdian’ woman appeared in the artist’s oeuvre, characterised by several signature features namely the almond-shaped eyes outlined by kohl, the voluptuous red lips, the golden complexion and the bulbous chest. La fille aux yeux verts (réplique) epitomizes Saïd’s female character and by stripping her of her name, she embodies the essence of Egyptian female beauty (estimate £80,000-120,000). Hanem also exemplifying Saïd’s depictions of ‘plebeian’ women, and an exciting rediscovery within Mahmoud Saïd’s oeuvre. 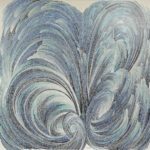 To date, Hanem was only known through a poor quality black and white image but shortly after the artist’s catalogue raisonné was published, it emerged from a private collection in Canada (estimate £120,000-180,000). Ramses Younan (1913-1966) became a founding member of the ‘Art and Freedom’ Society, whose motto ‘Long Live Degenerate Art’ was defined in their revolutionary manifesto published in December 1938. Painted in 1940 La Passion Sauvage or La Passion Devorante is Younan’s most complex composition that recognised him as one of the forerunners of the Arab Surrealist movement. La Passion Dévorante brilliantly incarnates various struggles: an inner struggle between the conscious and the subconscious, an outer struggle with society’s conformism, a physical struggle with politics and war, and an artistic struggle with academic art and ‘emptiness’ (estimate £100,000-150,000). ‘Simplicity is my philosophy’, said Egyptian auto-dictate Ahmed Askalany (*1978) of his oeuvre. His subjects are simplified human and animal forms. Born in 1978, Askalany’s work preserves the unequivocal assembly of traditional materials and craft methods associated with the ancient cultures of Egypt. His work is distinguished by accustomed aesthetic forms that place prominence on structure and volume alike, but in his Thinker, proportions are distorted with a minuscule head protruded from a colossal body. It possesses a sense of purity while simultaneously touching on aspects of isolation. A small head refers to little attention and space given to the thought processes concerning the social status in Egypt. Meanwhile, the large, voluptuous bodies could represent indulgence and excess that speaks directly to the political state of the Middle East (estimate £ 40,000-60,000). Founded in 1951 AMIDEAST, sponsors exchange programmes of artists, scholars and writers between the Middle East and America. In 1953 Jewad Selim (1921-1960) took part in the programme, which included exhibitions in Philadelphia, Chicago and Pittsburgh. 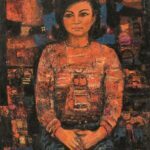 As a thank you he donated a painting entitled The Watermelon Seller, which AFME has now consigned for auction and the profits will help further artists to benefit from the programme. Painted in 1953, The Watermelon Seller, combines Selim’s inspiration from his Eastern tradition and Western influences he obtained when studying in Paris, London and Rome. The watermelon represents modern Iraq, the land of the two rivers, with its intersection of the Tigris and Euphrates and hints to the novelty of modern Iraq. The composition is rendered in shapes and the crescent shape is taking a leading role in representing the watermelon slices, an association to the fertile crescent of the Middle Eastern region, which is historically considered as the cradle of civilization. Leading figure of the Iraqi art scene in the 20thcentury was Shaker Hassan Al-Said (1925-2004), co-founder of Jama’et Baghdad lil Fann al-Hadith, Baghdad Modern Art Group. Untitled, painted in 1952, is an illuminous composition, where Shaker Hassan Al-Said chose to represent a soft peaceful subject of two birds, perched in a fruit tree.The symbolic of the representation is intense: The tree usually relates to an evolution of life, from the roots to the leaves or fruits. Here, he established a link with his homeland, historically the land of fertility where agriculture activities emerged with the first Mesopotamian civilizations. The lack of perspective and the simplifications of forms relates to his native Naïve art. Renowned to be one of the most emblematic figures of Modern and Contemporary Iranian art, Monir Shahroudy Farmanfarmaian (born 1924) depicts her own personality in the pieces that she creates. Using materials such as the mirror mosaic is historically reserved for important constructions in Iran and largely characterizes her oeuvre. She combines a traditional technique of glass mosaic and painting – developed during the Qajar dynasty time, from 1785 to 1925 – with a real contemporary aesthetic, related to the western abstract art. Title of the piece, dissociates from the artist’s other pieces whose shapes are mostly geometric. Here, Monir Farmanfarmaian realised an impressive work keeping this technique of the reverse glass painting on mirror which shows only four red lines going horizontally from on extremity to the other. The creation reminds the electrocardiogram which basically convey the heartbeats in a screen: the painted lines hug the shapes of the mirror and this creates sort of waves in movement, like a repeating cycle. Thus, the idea of longevity or eternity as a theme could be maintained in that there is not a beginning or an end in the composition (estimate £60,000-80,000). Iranian poet and painter, Sohrab Sepehri (1928-1980), was a pioneer in exploring the aspects of the art of modernity. Melding folklore with abstract expressionism, Western concepts and Eastern ones, he sees everything in the world as equals. Sepehri worked on Untitled from the abstract trees series in the early- to mid-1970’s. Through this piece and its counterparts, he invites the audience into an exploration of dynamics between the divine and the natural. To him, trees represented benevolence in a world polluted with malevolence. Their trunks served as representations of ample forte. His fascination in depicting sections of the trunk, rather than the entirety of the tree, was intentional and draws on Taoist principle of absolute truth. In his works, it is the imagery that is not depicted which alludes to the mystery of a unified cosmos while reflecting the limits of our perception (estimate £70,000-90,000). Considered as one of the most expressive and emotive artists of today’s Contemporary Iranian art movement, Koorosh Shishegaran was born in 1944. Working in different mediums, Shishegaran pulls inspiration from Iranian visual culture. He is best known for his dynamism, vigor, and vitality to create explosive, expressionistic compositions, where he delves into the modern human condition and creates his own painterly language to portray different facets of reality. In the present composition executed in 2005, Shishegaran uses cool blue tones and touches of yellow hues to describe an abstracted figure. Shishegaran cultivates abstraction and at the same time he creates a three-dimensional form by using his extensive brushwork and bold colors, conveying a wide range of emotions. Described as “father of the modern art movement in Syria”, Fateh Moudarres (1922-1999) remains one of the most illustrious personalities of Middle Eastern culture in the 20th century. His oeuvre is a fantastic marriage between past and present, tradition and modernity, and creates an extraordinary universe of its own. He usually depicted unidentified people in his paintings but just not in the two works presented in this auction. Untitled, depicts Amal Al-Ghazi, an important figure of Syrian society, friend and patron of the artist. Painted in 1974, Amal represents motherhood, as she is holding a young child, whose round-arched head – borrowed from the Assyrian statuary – is a recurrent pattern in the master’s paintings. The discreet perspective of the painting transforms the canvas into a bas-reliefs, showcasing the sitter in a straight position. The background is made of geometric elements and the composition reflects Fateh Moudarres’s fascination for Christian iconography by including a fish, traditionally symbolizing the first sign of belonging to the Christian community. Moudarres added golden leaves to the canvas, a reference to the technique used in icons, to underline the sacralised moment of motherhood, who loves and reassures. Untitled, portraying Giath Al-Ghazi, Amal’s brother, celebrates the fatherhood by using the same iconography as in the other portrait. Here, the sitter is embracing many young children and becomes the personification of strength and protection and moreover, the red tones heat the scene in order to emphasize the idea of shelter, illustrated by the embrace. Showing a unique style, the Syrian artist Marwan Kassab-Bachi (1934-2016) was born in Damascus and after completing his studies, he left for Berlin where he remained until his death last October. Undeniably inspired by the German Post-War era, Marwan concentrated on the creation of fascinating portraits, called “faces landscapes”, at the beginning of the 1970’s. Untitled, painted between 1976-1977 shows the sitter’s face in a three-quarter view, entirely occupying the canvas. Using colourless earth tones and hues of grey, green or ochre applied in thickening brushstrokes, increases the intensity of the subject. As a matter of fact, the deep gaze of the man seems to be blurred and directed to a distant and unknown beyond. As Marwan depicts the psychological introspection of his figure, he also creates a feeling of empathy for them. Shaffic Abboud (1926-2004) is undoubtedly the art icon in Levant. In the 1970’s, he started innovating his technique by working with materials such as mixed terracotta, strings, ropes and tapestry. La Veste Chinoise painted in 1980, presents on a plain background, the sumptuous closing of a Chinese veste, by using a multitude of colours which illuminate the canvas and reminds traditional Chinese costumes. He used geometrical forms, mostly quadrangular, as yokes sewed to each other as well as the brightness of certain colours – yellow and white – by emphasising on the quality of the jacket, probably embroidered of precious threads or even set with precious stones; which makes it feel and look heavy. The splendour of mosaics found in Byzantine art certainly inspired the painter too, “I am Byzantine” he said himself. Besides, the curving lines and the flexibility, the subject remains moving and gives an impression to be alive as it adopts an intriguing position. The shoulders are effectively seen in front view whereas the chest is leaning forward and a silhouette emerges as if walking toward the right side of the canvas. The object is vertically represented and appears to be personified to the extent that it is treated such as a portrait. “Each color has its own climate, creates its own particular world; inviolate, each color speaks with quiet seduction,” claimed the Lebanese artist Helen Khal (1923-2009). With that said, Khal explored the diversity of different colors and their contingency to others. In Helen’s work, abstraction and figuration complement each other. Although she loved expressing herself with abstract formations, the need to return to the human figure and the obvious shapes of nature constantly dawned over her. In the foreground is an image of a young boy in swim shorts while the background is a bundle of cool, blue colored, rectangular shapes that seem to be making out the presence of a pool or the ocean. Obviously inspired by the colors of the Mediterranean, Khal still manages to incorporate aspects of Americana. By combining elements of the Orient and Americanized concepts, she is able captivate her fascination by the light of the Mediterranean coast while simultaneously playing on her attraction to form and color exemplified by a bold use of horizontal lines (estimate £25,000-30,000).